Henderson, Nev. – Meet Dr. Lynn Dayton of Orem, Utah. Dayton recently won a Red Hot Sunglow Harley-Davidson “Street Bob” Motorcycle, courtesy of Las Vegas Harley-Davidson, and paid for by Hole In One International after he aced the 165-yard, hole 10 during the The Sam Schmidt Paralysis Foundation’s 5th Annual Racing to Recovery Golf Tournament, which took place at the South Shore Golf Club at Lake Las Vegas this past November. Dayton scored the ace, his second, using a 5 wood. But that wasn’t the only thrill… turns out thatalong with winning that sweet set of wheels, one of the witnesses to Dayton’s shot was none other than baseball Hall of Famer Rollie Fingers, one of tournament’s many celebrity participants. While having someone ace a shot is always amazing, this tournament had winners on many levels. That’s because over $160,000 was raised for the benefit of paralysis patients and scientific research. 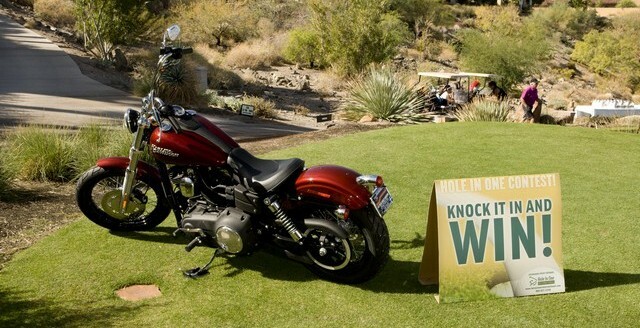 Want to learn more about adding a giant hole in one prize to your golf fundraiser? Email us or give us a call at 800-827-2249! Straightest Drive Contest: Fundraising Contest Idea #5Get an Instant Hole In One Insurance Quote… Online!